Local politicians, grassroots advocates, and educators launched a statewide campaign at Dickison Elementary School, Tuesday to raise awareness about a tax credit pilot program. 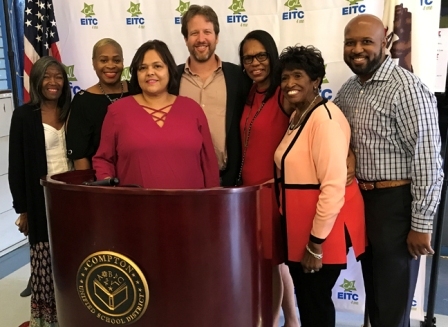 Micah Ali, Compton Unified School Board vice president, announced the district’s partnership with Joseph Sanberg, founder of CalEITC4Me. The statewide outreach and education campaign is on a crusade to inform one million new families about the state and federal Earned Income Tax Credit. It was great to be home, said Ali, who shared that he attended Dickison. He said he and Sanberg go back to 9th grade, when they advocated for Compton High School as student government members. Now, the duo works to carry the message about the California Income Tax Credit of at least up to $700, to low income communities in churches, coffee clutches, and schools. Their goal is to also engage the public in the fight for financial security and honor California’s hard-working families. The Earned Income Tax Credit has existed at the federal level for years, but just since 2015 in California due to Sanberg’s push. Residents who earn up to $25,000 are eligible for the tax credit. That’s up from $15,000 in its first. The tax credit literally gives cash back when individuals have earned below income, even when they don’t owe any taxes, Sanberg explained. Further, freelancers or independent contractors who work for themselves are eligible for the credit, and it may be applied retroactive for the past three years. “Working Californians deserve this money. It is your money, and you should be able to file your taxes. You’ve worked hard … tireless for your children and family, and you should be able to benefit from this,” stated Ali. Many in California did not take advantage of it, because they don’t know about it, he said. “If you really want to bring it down to Compton and why we’re here today, 5,000 individuals in Compton benefited from this earned income tax credit; just 5,000 out of roughly 100,000, which means we have a lot of work to do in order to make certain that people benefit from this earned income tax credit,” Ali continued. CalEITC4me and the Compton Unified School District will provide, starting in January, free tax preparation assistance, which would normally costs between $200-300. Volunteers may sign up for training programs scheduled for November and December at CalEITC4Me.org. The organization helped reach hundreds of thousands of families, who retrieved nearly $400 million, according to Sanberg. So far, some 368,000 have filed for the credit this season, funneling $200 million back to families. The organization identified the profile of many eligible Compton residents, who fail to claim the credit as areas with high concentration of Hispanics; individuals with lower incomes than required to file a tax return; parents (particularly mothers) of children of color; individuals participating in CalFresh and SNAP; those without qualifying children; and populations with limited English proficiency. Those eligible for CalEITC may also be eligible for nutrition, medical, auto insurance, energy, and home phone assistance. The pride of a single mom, Sanberg said he understands the reality that life in California is really had for single moms. They’re working many jobs, in many cases, yet earn barely enough to pay for their basic needs, such as food, transportation, rent and healthcare, Sanberg said. The reality is three-out-of four Californians couldn’t handle a surprise $700 expense, he stated. “A broken wrist. A couple of blown tires, maybe a busted pipe in your apartment away from financial crisis,” he exampled. That is part of what drove his organization’s demand for a program designed to actually make work pay better. According to Sanberg, 5,000 Compton residents claimed the statewide credit last year, but that number will expand to 15,000 this year. “Throughout California, 800,000 households claimed California’s Earned Income Tax Credit in 2016-2017 for a total of over $2 billion of state and federal Earned Income Tax Credits. Two-billion dollars that our neighbors are using for their basic needs,” Sanberg emphasized. When California launched its tax credit in 2015, advocates were excited for the victory, but faced two big problems, he noted. One was that $15,000 income eligibility was way too low. The other was that it didn’t count freelancing income, for example, money earned by housekeepers, ride-sharing drivers, gardeners, and more. Sanberg said they refused to accept that and organized to fix those problems, and achieved the goal not by lobbying and back room deals, but activated 70,000 people to contact their state representatives to demand the expansion. “It makes a really hard political climate when all you hear is you can’t. We won a big victory because of the 70,000 people that we activated, and next year, three times as many Californians will be able to claim their Earned Income Tax Credit,” Sanberg stated. That’s 1.7 million eligible families, up from just 600,000 during the past two years. “We’re told there are forces beyond our control, which will determine the future. We’re told that these big problems can’t be fixed, but what our win with EITC shows is those are lies. The future will be determined by the choices that we make,” insisted Sanberg. Darin Brawley, Compton Unified School District superintendent, and Dickison Pamela Neal-Robinson, thanked everyone for attending, and Ali and Sanberg for working more closely with school districts to help ensure that low-income families get the resources they’re entitled to and need. City and school officials in attendance included Margie Garrett (school district clerk), Alma Pleasant Taylor (school board member), and Councilwomen Janna Zurita, and Emma Sharif. Sanberg addressed the issue of eligible tax filers, who may have ‘undocumented’ dependents or relatives living at home, and understandable fears of that somehow triggering some actions such as deportations by the Trump Administration. The best he could say is what he knew: that the filing of a tax return and the information that the Internal Revenue Service and California Franchise Tax Board has, isn’t shared with the U.S. Department of Homeland Security Immigration and Customs Enforcement. “It certainly couldn’t result in the extension to other families that aren’t listed on that tax form, so the substance of what we know is that there’s no risk in filing a tax return if a family member in your household is undocumented, but obviously we’re only as effective as the information that we have, and I understand how scary it is to so many members of the community,” stated Sanberg. He hopes residents trust those facts in the law, and noted in the past year, some legitimate fears prevented people from filing and getting millions of dollars that could have paid for their basic needs. “The truth in the law is it does not,” said Sanberg.